In 2006, then United States Senator Ted Stevens famously said, in an analogy to support his argument for greater network regulation, that the Internet was "a series of tubes". This statement has been ridiculed many times as demonstrating Stevens' lack of understanding of the fundamental nature of the Internet and has since passed into net lore as a shining example of a ridiculous metaphor for the net. 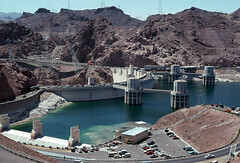 Hoover Dam and Lake Mead, a huge reservoir. At some point, analogies will break down. It's an inevitable property of using one concept to talk about another concept. You're not actually talking about the same thing, so at some level it has to make a difference that you're discussing, say, a series of tubes, rather than a distributed network of interlinked computers overseen by complex routing algorithms and multiple redundant links, which pass messages via a combination of copper cables, optic fibres, and radio transmissions. The important thing about an analogy is whether it breaks down before you've made your main point, or after. Because the raison d'être of an analogy is to use a simpler metaphor that parallels some complicated concept, in order to explain that concept. If you explain the concept, the analogy is successful. So in this sense, despite calling the Internet a series of tubes being a gross simplification, it's a successful analogy in that it made it easy to understand why enormous amounts of network traffic might be a bad thing. But back to the tubes. What else can we describe as a series of tubes? We have quite a few networks that really are made of tubes. The water mains, leading from a reservoir, through a purification plant, across the city, and into the taps in your home, are quite literally a series of tubes. As you progress along this series, from reservoir to home, the tubes split up to distribute the water, and get narrower because each individual tube further down the series needs to carry less water than earlier tubes. 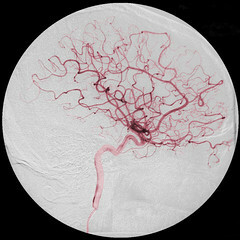 Part of my circulatory system - the arteries in my brain. Modern sewer systems are essentially the same thing, in reverse, with small tubes leading from your home, joining together with other small tubes to make larger and larger tubes as they carry more and more waste water towards a sewage processing plant. This and the fresh water pipes are two fairly obvious series of tubes. They echo fairly closely another series of tubes important to all of us: our circulatory systems. The muscles and organs in our bodies need oxygen and nutrients. The delivery system is a network of small tubes within our bodies. The pumping station is the heart, which beats rhythmically and with each pulse sends blood outwards through strong, elastic tubes which we call arteries. If we start at one called the pulmonary artery, it carries blood out in a network of smaller arteries (resembling the fresh water distribution network) to the lungs, where it picks up a supply of oxygen from the air we breathe. This blood rich in oxygen returns to the heart via a reverse network of tubes we call veins (resembling the sewer system), eventually forming one big pulmonary vein back into the heart. But this is not the same part of the heart we started at! The heart has two completely separate pumping areas, separated by a wall of muscle. The blood destined for the lungs is pumped from one side and returns to the other side, where it is now pumped out through a second set of arteries to everywhere else in the body. This second series of arterial tubes starts with the thick aorta, then splits apart into various major arteries such as the carotid artery taking blood up your neck to your brain, or the femoral artery taking blood down into your legs. These in turn split up into smaller and smaller arteries, eventually reaching tiny tubes called capillaries, which nestle right into the muscles and organs. The capillary walls are thin and allow the oxygen being carried in the blood to pass through into the muscles and organs. At the same time, the blood picks up waste products from the various parts of your body, such as carbon dioxide and various other chemical compounds. The capillaries eventually start joining together again and enlarging, this time carrying the blood poor in oxygen but now carrying carbon dioxide and other wastes. The capillaries have turned into veins, carrying blood back to the heart again! Major tubes of the human circulatory system. Public domain image courtesy of Wikimedia contributor LadyofHats, modified by me. These veins all join together and enter the heart back in the first chamber where we started. From there it goes back out through the pulmonary artery to the lungs, to pick up more oxygen, and also to dump the carbon dioxide into your lungs, where you breathe it out. While on veins, it's important to think about how the blood flows through them. The arteries are straightforward - the heart pumps and pushes the blood out at high pressure. But on the way back, the pressure has been dissipated in all the tiny capillaries and there's very little left to keep pushing the blood back to the heart. And in some cases the blood has to travel upwards, against gravity, from your legs up to your chest. What stops the blood going backwards? It turns out that veins have little flaps in them, that open when the blood flows one way (towards the heart), but flap closed if there is any pressure pushing the other way. As you move around and the movement of your muscles squashes the veins, the blood is squished and oozed along them... in one direction only - towards the heart where it's meant to be going. Now, what about the other waste chemicals picked up by the blood along the way past all the organs and muscles? Well, some of the oxygenated blood heading out to your body ends up in your kidneys, which are like sewage plants. They extract the chemical waste products of your body (and any excess water in your blood) and pass it through another, separate series of tubes that leads to your bladder. It's stored there until you visit a toilet and get rid of it. Another part of the system is the blood that supplies oxygen to the stomach and intestines. While there, it picks up nutrients from the food you eat (mostly sugars by the time your digestive system has had a go at it). So your blood also contains sugars, which contain a lot of chemical potential energy which the muscles and organs extract and use to fuel their operations. Blood contains lots of other things as well, and of course the way the rest of your body works is a long and marvellous story in itself, but that's off the track for today. All animals with bones (and some without) have similar circulatory systems providing the oxygen and food needs for their bodies, though fish get their oxygen from the water through gills, rather than from the air though lungs. What about plants? Plants too have a series of tubes that serves a similar purpose. In this case however it's not a closed circuit. Plant roots draw in water from the soil, into fine tubes somewhat like capillaries, called xylem. Only here they don't join up and get bigger; the tubes stay microscopically small all the way up the stalk or trunk of the plant. The leaves at the top use up water arriving in these tubes to make sugars, converting the energy from sunlight into chemical potential energy. (How they do this is also an interesting story in itself, which we might discuss another day.) These sugars pass back down to other parts of the plant in a second series of tiny tubes, called phloem, as sap. Unlike the animal circulatory system, these two systems of tubes aren't really connected in a continuous circuit. Getting away from the living world, another example of a series of tubes is the pneumatic mail delivery system developed in the late 19th century and deployed in several cities around the world, including London, Paris, New York, Chicago, and Prague. You may be familiar with the concept, as smaller local versions of such systems still operate in places like banks, factories, and large shops. A pneumatic tube system is a series of tubes about as wide as your arm, through which specially fitted capsules travel because of suction from the other end, provided by a pump hooked up to the system. At the ends of the tubes are access slots, which allow people to put capsules in for delivery, and to remove arriving capsules. The capsules can contain anything that fits inside—typically small objects of some value such as money, mail, documents, scientific specimens, or machine parts—and needs to be physically delivered to another location. The city-wide pneumatic systems were mostly for carrying mail. So we've moved from tubes that carry water or other liquids, to ones that carry information. The next step is to move slightly away from the concept of a tube as a hollow pipe with nothing inside but perhaps the air or liquid or objects being pumped through them. Consider copper wire. It's solid through to the core; there's no way you could push air or water through it. But copper is a metal and a good conductor of electricity. Electricity is essentially the movement of the sub-atomic particles we call electrons. Electrons move very easily through solid copper, but not through the plastic coating that typically surrounds a copper wire. To electrons, a copper wire is just like a lovely tube for them to move through. Someone using a series of tubes for entertainment. Now consider all the wires leading from a power station, where electrical energy is generated (or rather, converted from chemical potential energy, or the kinetic energy of falling water, or other forms of energy), to your home. They run across fields, into the city, into a substation, where they are split up and distributed through smaller wires until they reach the sockets in your walls. The electricity distribution grid is, in many very deep ways, precisely the same thing for electricity as the mains water supply is for water. It's a series of tubes for electrons to flow through, from a source, to your home. Wait a minute! If we make the relatively small conceptual jump that a piece of copper wire is a tube for electrons, then the Internet really is a series of tubes! Okay, there are some fine details here. A lot of the Internet is connected not using copper wires, but by optical fibres. But really, an optical fibre is just a tube through which light passes. Where the tube analogy gets trickier is wireless networking. This is using radio waves of various frequencies to communicate electrical information between physical computers. The radio waves just travel through the air. If you think about it, this is really just a tube, without the tube. Which leads me to one of my favourite analogies of all time, one that I invented myself some years ago. Quipu are cunningly crafted collections of string used by various pre-Columbian peoples of the Andes, including the Inca. They were used to record information, in a series of knots that encoded both numerical and other data. Some researchers conjecture that quipu are essentially capable of recording anything you can express in language. So quipu are sort of like books. Or in more modern parlance, they're a bit like computer files. If you were an Inca and wanted to send a bunch of information to someone on the other side of the valley, you might even imagine a system like an old string washing line, in which you tie a quipu to one line and pull the connected line through a pulley system to deliver your quipu and its message. It's exactly like pulling a knotted collection of string along another string. Only without the string. Or in some cases, considerably bigger. I haven't talked about electrons yet, but most of you probably know something about them, or at least have heard of them. 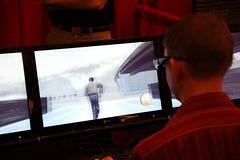 Last Modified: Thursday, 29 December 2011; 21:55:53 PST.